Strange that a term called ‘Black Friday’ has been adopted by the public in a semi-positive manner. Of course, it’s not positive for those working the large stores, putting in insane hours for the rabid masses trying to score manaical deals on objects. Of course, there are some ways to avoid the chaos. Shopping online is one way. There’s also hitting up non-mall shops, independent stores in a way to support some alternative gifts. After all, why bother with the hassle and the rabid mobs, especially when the situation dictates that using a chainsaw is a social faux pax. Instead, you would be wise to shop from Jezebel Charms. Not only do you avoid the claws of parents and tech fiends looking to spend three hundred dollars on a 56″ plasma screen, but you purchase something unique, spooky and classy. The chances of seeing some kind of hallucination from drinking Absinthe is also the same chances of getting really, really drunk. 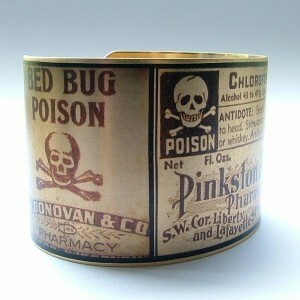 Probably the same odds of killing yourself if you’re foolish, as displayed by this cuff bracelet. Of course, you might end up with a combination of all three, hallucinating having a drink with Death. If you can avoid the risk but still have the drink with Death by buying this bracelet and hitting up a bar. 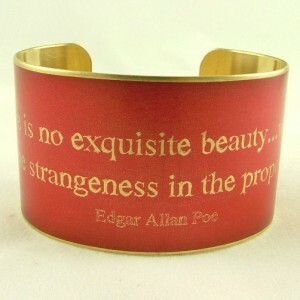 Feeling a kinship with Edgar Allan? Or perhaps you live in Baltimore? The quote is great and might sum up your worldview. Wear your heart on your sleeve but your motto on your wrist. 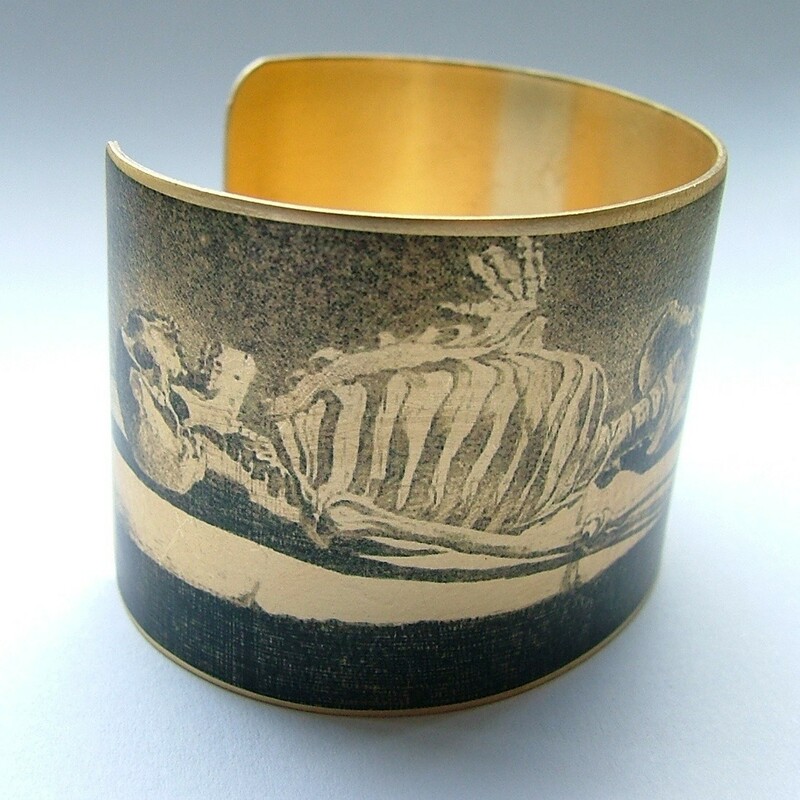 The cuffs of Jezebel charms are delightfully multi-applicable, as you can go from Victorian to Goth to Steampunk to general spooky punk without having to change your accessories. It’s not so much if you were to go from Black Metal to Speed to Stoner (a lot of make-up is involved.) 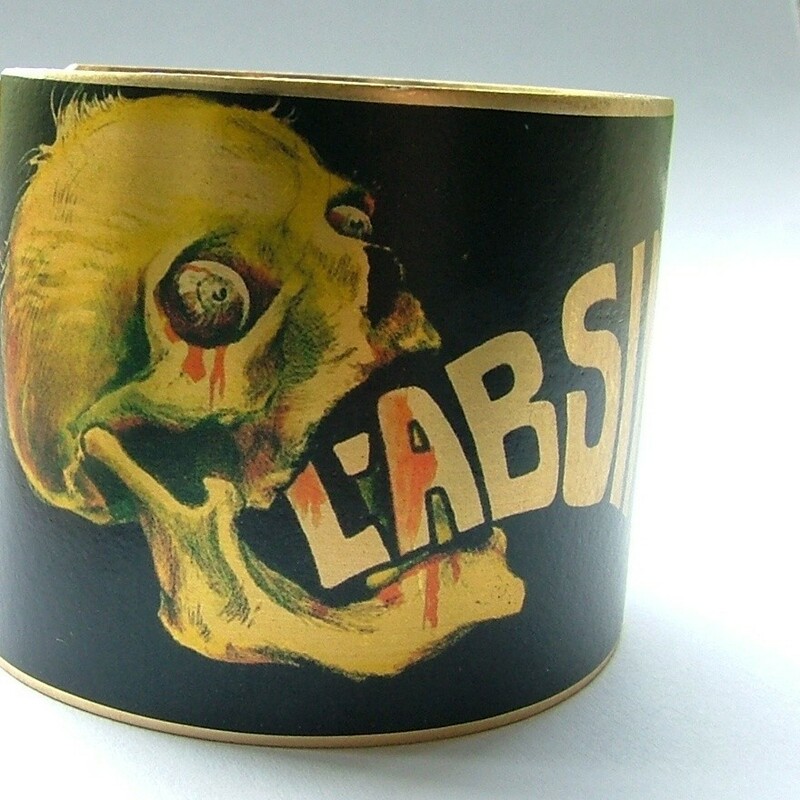 All the cuffs, like the Poison one (not related to the hair metal band) above are made of quality metal that is adjustable with a little bit of pressure. And where else are you going to find something that looks that wonderful? Nowhere. Jezebel Charms also have necklaces and cuff links, for those more formal events that you want to add a particular spice. 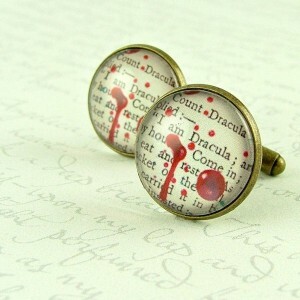 It’s clever to utilize these literary cuff links to intimidate those you might see when interacting at a Christmas party. Remember, it’s all about silent communication. 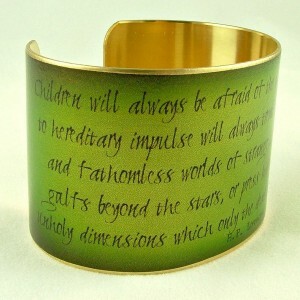 For all you Lovecraft enthusiasts, Jezebel Charms have not forgotten you. Here, they recreated a wonderful quote from the writer’s essay on the nature of horror. If you want to be reminded why you’re submitting that story to Arcane magazine, or why you keep scouring the flea markets for rare and out of print paperbacks, it all deals back with the nature of fear. Keep this cuff on and the wisdom close by. 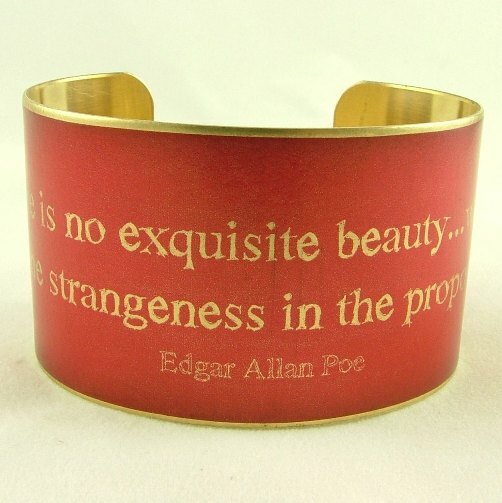 Find all the wonderful wares on sale over at Jezebel Charms’ etsy store. Order soon to get in before the Christmas rush. Avoid the sleepy masses on Friday. Be wise, not unwashed. And be back here on Tuesday for another uEtsy spotlight.